I am undoubtedly a Darcy girl. Always have been and always will be. He is the most perfect man (or fictional character, as you’d like) that will ever exist. Well…Mr. Thornton is a worthy competitor and Wentworth touches my heart, but it has been Darcy for a long time, so it’s hard to take him out of the podium. For that reason a novel who’s main character is Col. Richard Fitzwilliam would not call my immediate attention if it hadn’t been written by someone as Jennifer Joy. I have said many times that I love Jennifer Joy’s writing, and her Cousins Series really got my attention, so despite being a Darcy girl, I read this book with an open heart, and guess what? Only a few pages read and I already wanted to get inside the book and give some affection and love to our dear Colonel. 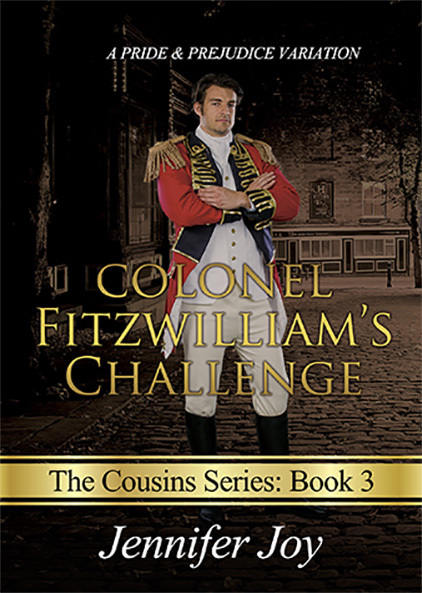 As I continued reading I understood Col. Fitzwilliam’s Challenge was not like Jennifer Joy’s previous books as it is not just a romance story, it is a book full of suspense, mystery and intrigue. In this book, Col. Fitzwilliam is offered an assignment that will bring him, not only an internal struggle between what have always been his principles and what his heart is telling him, but also a struggle against enemies of the crown that will not make it easier for him. I kept suspecting some characters along the book, and even if I was partially right, there was a huge surprise for me in the end. While my suspicions kept telling me someone was a villain, that person was actually the one who would solve everything and save the Colonel. I won’t say much more, because part of the fun in reading this book is guessing who the spy is, but I would truly like to know if other readers deciphered everything or if they were misguided as I was. I enjoyed some of the new characters that were introduced to us, namely Adélaïde Mauvier. I liked her immediately and her life story captured my attention. I like strong female characters and was happy that Jennifer Joy decided to create such a person for Col. Fitzwilliam. I was only sorry the story advanced so fast as the characters feelings and turn of events felt a bit rushed for me. I would like to have spent more time with Col. Fitzwilliam and Adélaïde Mauvier and to have seen more interactions between them that would allow us to see their feelings grow and mature. But I think that wanting to spend more time with a book is a good sign, so I have to say that Jennifer Joy did it again! In a very different way, as this book was not so characterised by the romance and depth of feelings as the previous, but more of mystery and suspense, but she wrote another book definitely worth Reading 🙂 We can see Jennifer’s writing is diversifying, so I’m eagerly waiting for her next novel. I’m so happy you enjoyed Colonel Fitzwilliam’s story, Rita! He was a hoot to write, and I’d like to write more variations for him, but let me reassure you that my next novel will feature our beloved Mr. Darcy : ) Thank you for your review! I haven’t read Jennifer’s books yet, but now you have me even more interested to start one soon. Thanks for the review, as this is a series I’ve been looking to learn more about. I’m such a Darcy girl too, it’s a little crazy! It may be too much pressure for anyone person to handle, lol!! They are stand alone books but with a connection between them. I think it is interesting to see the stories of all cousins. The only one I haven’t read yet is Anne’s Adversity, but it is on my “to read” list. I have also loved Jennifer Joy’s Earning Darcy’s Trust. The writing is wonderful! If you haven’t read anything from her, I would recommend starting with this one 🙂 I’ve also reviewed it and even mentioned some of my favorite sentences in the review, I’m sure you’ll understand what I mean regarding her writing when you read those sentences 🙂 They are beautiful! Yay! I’m happy your curiosity is piqued 😀 Darcy will always be my favorite character to write, but this series was a wonderful opportunity to explore the secondary characters— and it turns out that they’re pretty cool too! Ah, it must be terrific if an avid Darcy lover could fall in love with his cousin’s story, too. I like turning frowns into smiles : ) Thank you for your comments! I hope you enjoy the story, Tia! And no worries on the writing front… It’s much too fun to give up! You were the one who inspired me to add a pinch of mystery and intrigue, Mammy! I’m glad the ending held some surprises!